Normally evolution does well with certain models along with assumptions (without observational data). But according to a new research paper in nature not even models which hold to certain assumptions confirm evolution! Four universities conducted research on contemporary human populations in order to discover advantageous mutations, along with the rate of degradation by mutations. Trying to understand diseases from the present is one thing, it’s quite another trying to obtain knowledge of historical evolution which goes by the assumption of many millions of years. The researchers used the term “explosive population growth” because of its long age assumption whereby, “selection has not had sufficient time to purge them from the population.” Researchers then claim that Europeans had stronger genetic drift, than Africans which is strange because genetic drift doesn’t know the difference. Obviously, they are fudging their assumptions in more ways than one! Advantageous mutations? Where are they? The researchers provide no examples in which they observed! They merely assumed it, because it’s part of evolution! This is what you call, “circular reasoning!” If the supposed evolutionary past doesn’t add up with the present data, how is this shed light on future patterns for evolution? When a theory displays a considerable pattern that shows increasing complexity in its explanation, the theory is not valid! Rather than observing advantageous mutations, they observed a “larger burden of Mendelian disorders” afflicting mankind which is vital for understanding diseases not evolution. The research does however confirm a creation scientist’s (John Sanford) proposal which is known as genetic entropy where the genetic load increases dramatically. That would be a problem for evolution, because that observation makes it impossible for mankind to survive tens of thousands of years! The researchers are baffled by their finding as one can read by what they expected in the evolutionary framework verses what they observed! Their findings conflict with the whole long ages notion which comes from the ‘theory’ of evolution but does shed light on understanding diseases better while containing evidence for a population that has been around for 5,000 to 10,000 years! Which confirms what? Yes! It confirms creationism! Geneticists are in the process of engineering molecules which is great science, but when scientists alter molecules which is not found in nature, are they performing evolution which is a mindless unguided process or intelligent design? Is there any evidence for evolution in the experiment? Here the paper uses circular reasoning, “Genetics provides a mechanism for molecular memory and thus the basis for Darwinian evolution.” There was no observation of nature selecting the defined structures nor the targets, nor the aptamers! It was an international team of scientists who did the selecting! Not only that but their altered molecules “remains relatively inefficient.” unnatural or designed by scientists are poor polymerase substrates at full substitution. Other media makes wild claims that this experiment produces a more understanding about the origin of life which is nothing more than presupposes the existence of DNA. Because without DNA along with its specified information, and proteins to build DNA, nothing happens! Unless scientists are observing this in nature without their tinkering around, this is not evolution rather they are tinkering with something that was intelligently designed by God. Even if evolution was true, just because it was done in a lab, doesn’t mean nature does it and altering molecules in a lab is not a demonstration on how evolution works rather just like evolution itself, it’s a man-made up story about the experiment. We generally don’t think much about plants except what they produce like fruits and vegetables or for decoration. They seem so slow to us and stationary, but actually they move and breath and carry on their lives in truly amazing ways! Did you ever ask, how do plants know when it is spring time or winter time? So how do plants do it? In reviewing a new book, The Restless Plant by Dov Koller (Harvard, 2011), Roger Hangarter’s Plants-in-Motion web site was referenced the site has time-lapse videos of plant movements. Evolutionists are clueless with plant evolution but not at a loss for using imagination in their explanations! The Moody Institute of Science made one of their most beautiful and intriguing films about plant movements back in the 1990s: Journey of Life! A must see for any video library. Plants are not to be taken for granted! Why are the planets moving backwards? We must figure out why this gap is seemingly the case in the theory of Geocentrism. Perhaps Heliocentrism is a better alternative! Nah, geocentrism is an undisputable fact, eventually this observation will be explained thus preserving it…Ok, that’s not about fruit flies and Darwinian evolution, but you get the idea. Natural selection is presumed to be a miracle worker, that can produce the brain, eyes, ears, nose, and mouth in a step by step process using mutations. However, it doesn’t work theoretically nor historically, nor experimentally. It’s a failed ‘theory’ that relies on story telling. This newly discovered function in RNA unrelated to protein production is vital in fighting tumors! Without this presumed piece of junk with only history in it’s sequences your chances of getting cancer go extremely up! A complete surprise by evolutionary scientists because if evolution was true it ought to leave junk behind right? Because of this faulty concept that evolution promotes, growth in knowledge has been hindered! Evolutionists insist it looks like the wind blew it together, rather than intelligently designed. The Darwin crowd should not be so surprised by these discoveries, there is a pattern of junk DNA having some kind of function. Instead of assuming it’s junk, they better start asking other questions like why has it been placed there, for what purpose? When unable to answer, it shouldn’t be considered junk for history value rather no known function has been found but continue research. If evolutionary geneticists think outside the box of Darwinian evolution, they will discover even more amazing things! Keep in mind there is more research to go with the Neandertal’s genome because only 60 percent has been recovered so far while a third of it has yet to be sequenced. Also, more research includes gene regulation which could reveal even more similarities which deal with function rather than sequence. What is more revealing, Europeans and Asians share about 1% to 4% of their nuclear DNA with Neanderthals, indicating that there was substantial interbreeding that went on between the two groups in the past. This is very important evidence because when a species can interbreed like in this case Neanderthals and modern humans then they are the same species! Creationism vindicated once again! “A Draft Sequence of the Neanderthal Genome” by Green et al.1 Some 55 authors are listed on the paper, including Svante Paabo, who has advanced theories about Neanderthal interbreeding for years. The NY Times, a militant publication for evolution attempts to keep the old assumption alive by suggesting we are still distinct from Neandertal man. But even in places like John Hawk’s blog who is an Associate Professor of Anthropology at the University of Wisconsin answered his own question if this means Neanderthal man belongs in our species and the answer was a resounding, “yes”. Neanderthal research through the years has never been a search for unbiased truth about the history of humans rather it was about looking for that evolutionary story using artistic reconstructions as the main prop on how a cell became a specialized complex human being. 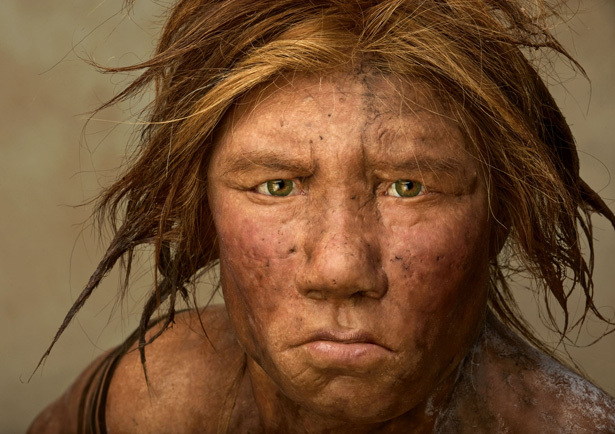 Fictional stories were invented telling us about how Neanderthals split 650,000 years ago only to encounter modern humans to interbreed with 100,000 years ago. Logic would seem to indicated that the time span of 550,000 years would have drifted Neanderthals so far apart that interbreeding would have been impossible with modern man. What was our hominid ancestors doing for 150,000 years and then invented agriculture and domestication so recently and so abruptly? Do you see how absurd these evolutionary time frames are in relation to the evidence? So who were these Neanderthals? No, they didn’t live 650,000 years ago. They were people who migrated after the Flood, like everyone else. They became a very close-knit tribe which separated themselves from others. Inbreeding of tribes led to accentuated features. Physical characteristics or traits could have been caused by their diet custom or a harsh environment, age, or disease. Neanderthals did not arise out of such things as population bottlenecks caused by major diseases nor massive murders carried out through the centuries which reduces the gene pool. 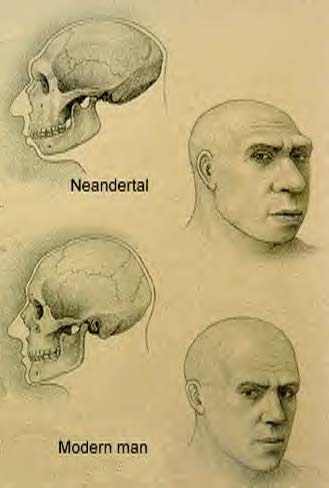 It explains why the percentage of Neanderthal DNA found in modern humans is small. In the Book of Genesis it advocates a world of distinct reproductive groups varying within their kinds which we observe today. The amazing new research reveals what creationism expected so after 150 years of being taught the wrong things about Neanderthal man because of the storytelling in evolution, it’s time to put the old evolutionary assumption about Neanderthals which is long overdue to rest! “Jerry, We have some history in which you find fault with my presentations, and in which you cite your Duke and Stanford degrees and experience in business communications as qualifications for offering up your criticisms. Obviously, Dembski went into is comfort zone which is physics rather than chemistry. Most likely Stephen Meyer could have addressed the chemical aspect. But this brings up the “Genetics First” hypothesis (chance formation of nucleic acids) verses metabolism coming into existence first. The later has been rising in popularity in certain camps. Evolutionists believe replication of chemicals must be in play before natural selection can pick the best material so it can build it into elephants, sharks, humans, you name it. We know metabolism-first scenario is plagued with many problems of its own as indicated in this paper. Anyone can generalize the notion of a replicator up to a system or network of molecules instead of requiring a genetic code but replication has to be accurate! In a designed world we live in, there is not much room for error, in the story of evolution there is plenty room for errors which supposedly result in updates or upgrades. Does this sound familiar? I have repeated this theme many times in various topics when it comes to the scientific method concerning data. Just because there is a claim that it could happen, doesn’t mean it ever will. For example, some might believe O2 levels increased sizes of animals and could test O2 levels in tanks to see if it had effects on smaller animals. Then say well we haven’t found it yet, but we believe it will show results. This doesn’t mean certain O2 levels can evolve by a million-fold. “Whatever the original input, one would finish with an equilibrium mixture, the composition of which is determined by thermodynamics.” Equilibrium means you are at a standstill and nothing more will happen. Back to the ID debate which I opened up with. Even though Jerry was vague in his assertion that the laws of chemistry should have been included in the debate for ID, it’s certainly in the debate for creationism. Science has said “no” countless times to evolutionary prediction, assumptions, and other stories. But science has said “yes” to a creator, an intelligent designer, namely God!